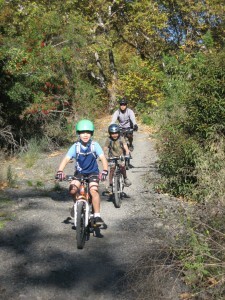 The CORBA Kids Club returned to Sullivan Canyon for our monthly ride. Four dads, one mom, and 6 kids participated. You can view photos from the ride here. 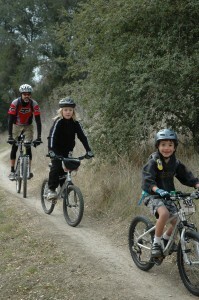 On Saturday April 6 the CORBA Kids ride Malibu Creek State Park. Meet in the lower parking lot at 9 a.m. Email corbakids@corbamtb.com for more information. 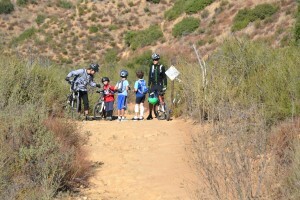 On February 2nd, four kids and and four adults rode Cheeseboro Canyon through Sulpher Springs and to the first big wall. New riders Josh and son, Zachary joined us again, and Joy and RJ came back after several months. 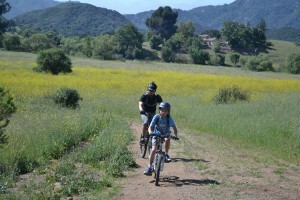 Larry hiked along side son, Elliot who was determined to ride on training wheels, and he did! It was a perfect day; the weather warmed up gradually, and the kids had lots of opportunities to practice trail ettiquette as the canyon was very busy with runners training for the upcoming marathon in March. Click here to see pictures from this fabulous ride. Next ride March 2 at 9 a.m. Sullivan Canyon, Brentwood side. Hope to see you and your kids there! 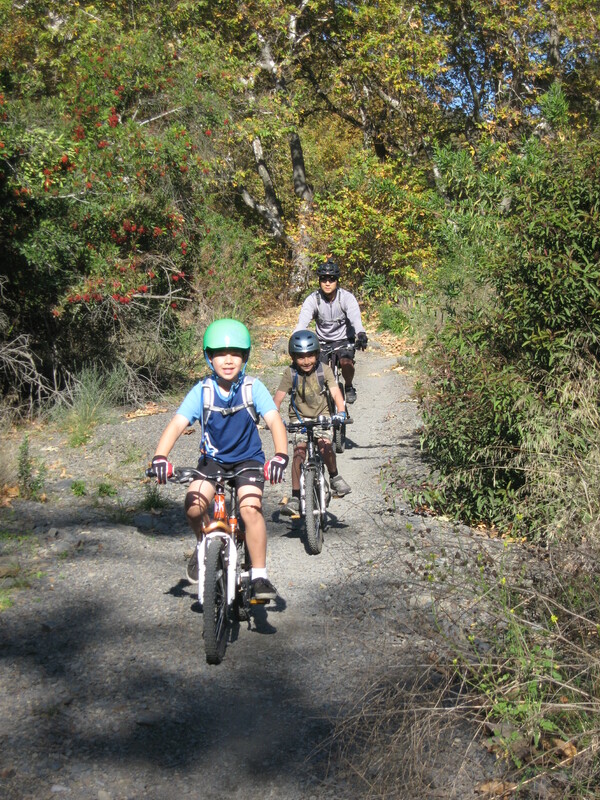 Despite being rained out last month, and being busy with the holidays, the CORBA Kids Club has been busy riding the trails! Oliver’s friend, Jack. Welcome, and we hope you continue to ride with us! 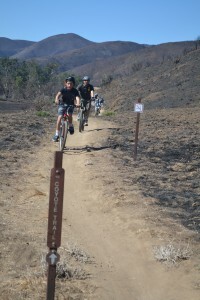 Next ride will be Cheeseboro Canyon on Saturday February 2nd. Meet in the upper (dirt) parking lot at 9 a.m. The CORBA Kids Club had a busy spring with a ride to the MASH site (MCSP) in March, Cheesboro Canyon in April, and the Grasslands Trail (MCSP) in May. Started by 3 families who met at the 2011 Take a Kid Mountain Biking event, the CORBA Kids Club offers families with children free monthly organized rides in and around the Santa Monica mountains on kid-friendly terrain. Click here to see photos from our April and May rides. Our next ride is Sullivan Canyon, (Brentwood side) June 2, from 9 a.m. to noon, and we hope you will join us. Email kidsclub@corbatmtb.com for more information. The CORBA Kids Club started the New Year off right with a return to Sullivan Canyon in January and a Malibu Creek Park ride in February. January’s Sullivan Canyon ride saw the kids improving their skills, with everybody riding over the cement waffle blocks that most of them walked in December. The downed tree still blocked most of the main trail, and we used this as an opportunity for a snack break before heading back to the cars. Everybody showed great improvement on the hills. Five adults and six kids participated. Check out the pictures from this great ride. 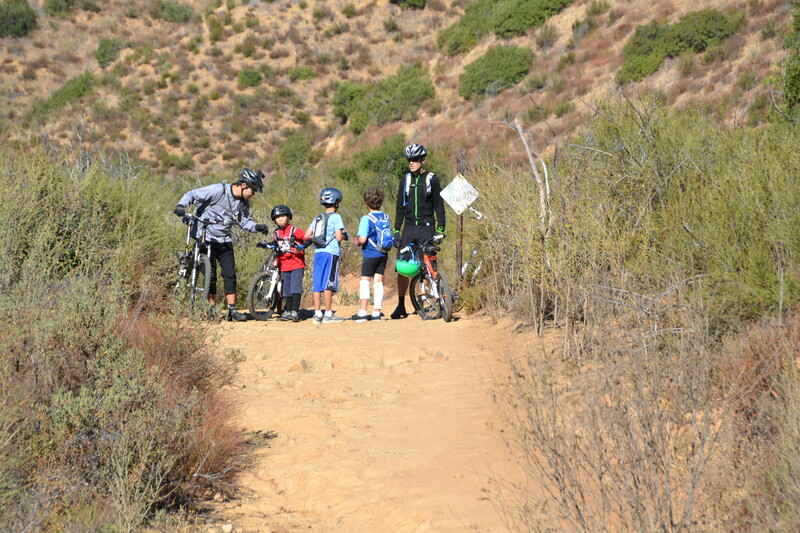 The CORBA Kids Club explored the Grasslands Trail during February’s Malibu Creek State Park ride. Dave taught the kids how to do a break-check on their bikes, discussed proper helmet fit, and how to handle horses on the trail. The morning started out cold, but everybody was pealing off layers by the time we hit some of the big hills. The skies were clear, the air was fresh, and it was a perfect day for a ride. We had the single-track route pretty much to ourselves until we came across a large group of MBU trainees on our way back. There was a very challenging hill before our first break, and most everybody walked up, but two of the kids went down it twice. We also did some hiking sans bikes, all of which you can see on the photo gallery for this ride. Four adults and four kids, including two first-timers, participated. There is a lot more to explore in Malibu Creek State Park, so we will be back there in March. 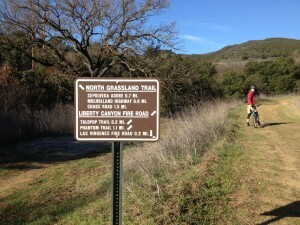 Saturday March 3 in Malibu Creek State Park. Meet at 9 a.m. in the lower parking lot near the wooden stairs. Email kidsclub@corbamtb.com for more information. 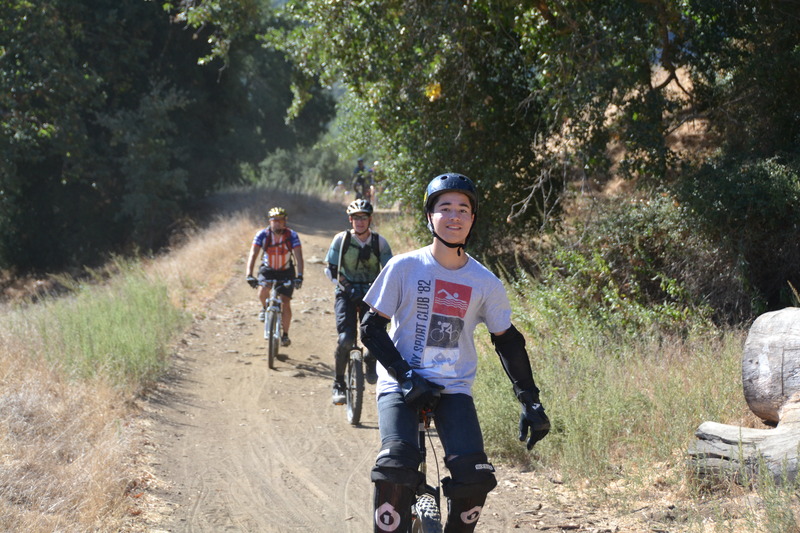 A small but enthusiastic group rode Sullivan Canyon on Saturday December 3rd. Dave and Nolan, Kat and Josiah, and John and Ethan met in Brentwood, where the weather was cool and the winds were calm. Dave gave everybody a brief overview of the trail ahead, stressing the importance of speed control down the first paved hill. The group rode the gradual incline for about 2 miles, some choosing to walk rather than ride over the concrete waffle blocks that dot the area. A downed tree blocked the rest of the trail at about 2 and 1/2 miles in, so the group took that as a sign to take a break, have a snack and explore the area. Kat found a small bit of California Sage, and introduced the boys to what some hikers call “Cowboy Cologne.” The boys pretended to be characters from Star Wars, and then Kat pointed out the large leaves on the trail, which were bigger than most of their faces. The ride back took about 15 minutes because it was all downhill, followed by one challenging paved uphill back to the cars. Check out the photo gallery of the ride, and you can also see the downed tree. Because it was a small group and everybody enjoyed the location so much, we’ll be back at Sullivan Canyon on January 7th, and we hope to see more of you there! 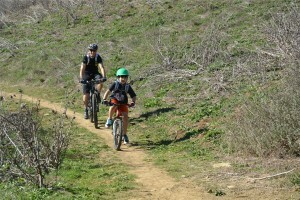 Meet on the Brentwood side: http://www.socalmtb.com/socal/trails/sullivan.htm. 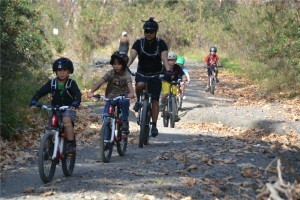 Though it was a small group who showed up for the November CORBA Kids ride in Cheeseboro Canyon last Saturday November 5, their enthusiasm ran big. Light rains the day before provided perfect riding conditions. The summer dust was lightly packed, the skies were clear and blue, and the temperature was pleasantly brisk. After our standard greetings, 3 adults and 3 kids saddled up and headed out. Dave rode up front with Ethan and Nolan, John rode with Josiah, and Kat was sweeper and some-time photographer. When we got to “The Bees,” John guided the kids one-by-one through a small water crossing; the kids did great! We continued on until we hit 3.25 miles before taking a break and turning back. Most of the kids were tired after a total ascent of 500 feet. During the break, John demonstrated the strength of his Kevlar gloves. He dared the kids to hit his gloved knuckles with a rock, and they each took a turn. After watching a large group of adult riders negotiate some technical rocky areas, the group saddled up. 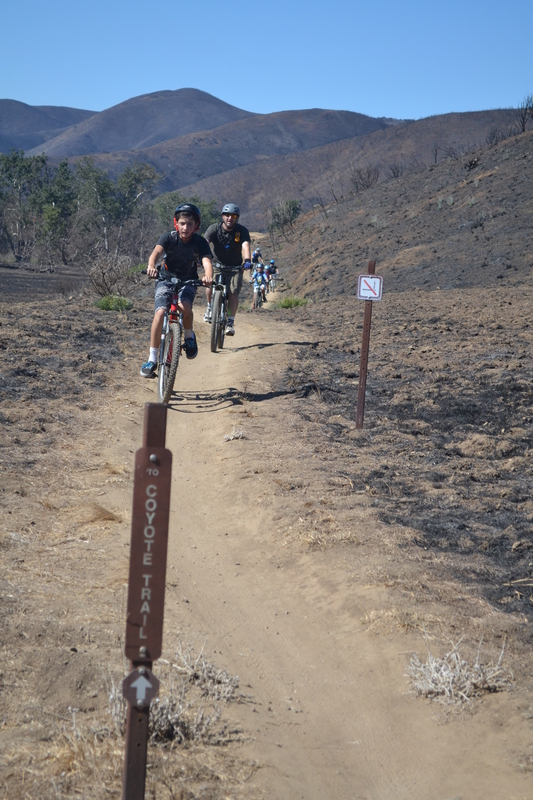 Most of the kids were uncomfortable riding back down some of the rockier sections, so they learned another lesson in mountain biking: There’s no shame in walking! Once we got past “The Bees,” everyone enjoyed the mostly downhill ride back to the parking lot. After the ride, the kids snacked on chips and cookies, while the adults compared bike racks. Check out the photo gallery of this ride. Next ride will take place Saturday December 3rd in Sullivan Canyon; meet on the Brentwood side: http://www.socalmtb.com/socal/trails/sullivan.htm . Hope to see you there! 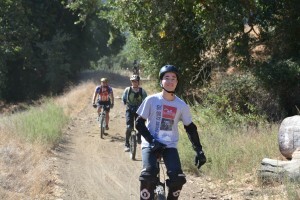 On Saturday October 1, 47 riders came out for the IMBA’s Take a Kid Mountain Biking Day at Malibu Creek State Park. Riders on unicycles, trailer bikes, tandem bikes, and various sized mountain bikes dotted the trail on a pleasantly warm October morning. While families arrived and signed in, early-birds rode around the parking lot to warm up after readying their bikes. After reviewing trail etiquette, fearless leader Hans Keifer, CORBA Kids Club members, and many new comers hit the trails. The first challenge was a dry creek crossing, and the kids were troopers, as you can ssee when you view our photo gallery of this event. After a short break where we waited for the slower members of the group to catch up, we headed back past the visitors center, and some riders rode up the big hill leading to the MASH site before heading back for a fine BBQ lunch! If you liked this event, or you misssed it and you want to try riding with other families, please join us at our next CORBA Kids Club ride on Saturday November 5 from 9 to noon in Cheeseboro Canyon. Email kidsclub@corbamtb.com for more information.